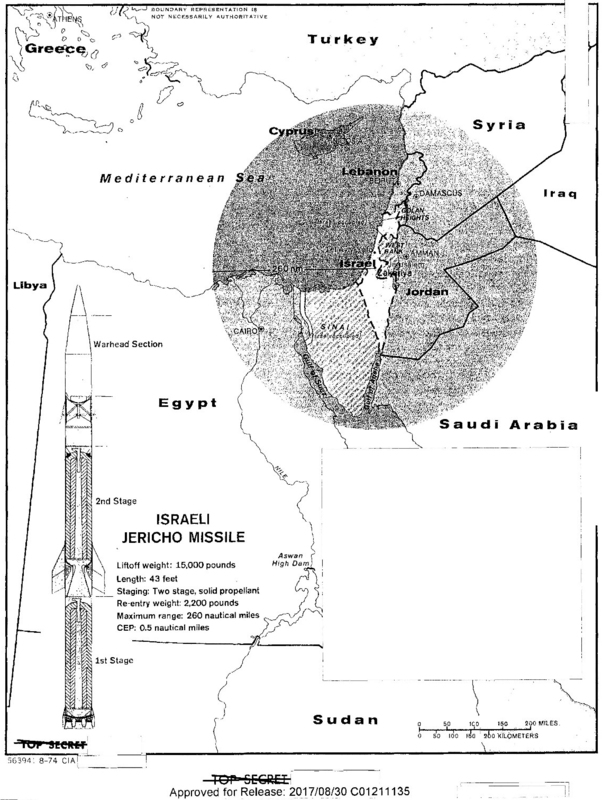 The Central Intelligence Agency believed that by 1974 Israel could strike all of its bordering countries with nuclear-tipped two-stage Jericho missiles. Israel was viewed by CIA as a proliferation threat via sales of turn-key nuclear weapons systems to its close allies such as apartheid South Africa. This was corroborated in year 2012 news reports revealing Israeli sales contracts. Although the now-defunct Atomic Energy Commission (AEC) demurred, the CIA also believed that a substantial quantity of weapons-grade highly-enriched uranium (HEU) was diverted from the Nuclear Materials and Equipment Corporation (NUMEC) in Apollo, Pennsylvania to Dimona for weapons production. These stunning new revelations are contained in the top-secret report Special National Intelligence Estimate, "Prospects for Further Proliferation of Nuclear Weapons" otherwise known as the 1974 SNIE. The CIA believed both India and Israel were "potential sources of assistance relevant to nuclear weapons proliferation." The CIA did not believe that Israel would openly help foreign countries with nuclear weapons development because they were "highly dependent on the U.S. for critical military items." But exports of complete "turnkey" delivery systems including nuclear warheads could help the Israelis keep the Jericho missile production line from shutting down. The CIA stated in a previously redacted paragraph that, "The Israelis have close ties both to Taipei and to South Africa and we cannot rule out bilateral or trilateral cooperation in the nuclear weapons field." Researcher Sasha Polakow-Suransky confirmed in 2012 that in 1975 Israel’s then-defense minister Shimon Perez offered nuclear-tipped Jerichos "in three sizes" in a sales contract to apartheid South Africa’s PW Botha. But the CIA appears to have been mistaken about Israel’s willingness to assist foreign country weapons development. It is commonly believed among experts that the 1979 "Vela incident" was a joint Israeli-South Africa nuclear test in the Indian Ocean. However, in 2016 former Nuclear Regulatory Commission Commissioner Victor Gilinsky elaborated in Haaretz that many American nuclear officials considered it to be an Israeli tactical nuclear weapons test. "It also is likely that the Israelis acquired a quantity of weapons grade uranium some years ago, in which case they would only have had to fabricate the weapons in order to have a small stockpile." "The Assistant General Manager for National Security, Atomic Energy Commission has no information that would support this statement. He notes, however, that his reservation on this statement does not constitute disagreement with the overall judgment of Israel’s nuclear weapons program." The footnote is consistent with the AEC’s long denial that NUMEC, which it licensed, regulated and provided with tons of dual-use material under government contracts, was an Israeli smuggling front "from the beginning" as two high CIA officials familiar with NUMEC claimed. In the mid-1960s the AEC discovered massive losses of highly enriched uranium and cover-ups of losses at NUMEC. In 1968 an Israeli covert operations team, presenting false credentials to the AEC, but using their real names (Rafi Eitan, Ephraim Beigon and Abraham Bendor), penetrated NUMEC with the assistance of the plant’s owners. Former AEC commissioner, Glenn Seaborg, when told in 1978 by Department of Energy staffers that traces of the material from NUMEC had been picked up outside Dimona, later refused to meet with FBI investigators. By 1980, the FBI obtained an eyewitness account of diversion from the plant’s loading dock that occurred in the mid-1960s overseen by NUMEC president Zalman Shapiro. No indictments were ever filed. After initially warning the Department of Justice about the diversion in 1968, the CIA withheld evidence from the FBI about why it was certain the diversion had occurred, according to documents released in 2015 via a FOIA lawsuit. Author and investigator Jefferson Morley, suggested in a 2018 presentation about the CIA-Mossad relationship that such instances of the CIA "looking the other way" may have been a result of the long-term, intense cultivation of rising officials such as James Angleton as well as the CIA’s desire for reliable intelligence on the Soviet Union obtained by Israel. The SNIE contains much additional information about the CIA’s assessment of why Israel so badly wanted nuclear weapons as well as previously unreleased analysis of India’s program. The long-delayed release comes at an interesting time, as both the US and Israel allegedly signed a secret memorandum of understanding to pursue Iran through covert actions asserting – with no evidence – that Iran has a nuclear weapons program. The US Supreme Court recently refused to hear an appeal by 70-plus Apollo-area plaintiffs that sued the current owners of NUMEC. The Plaintiffs alleged in an 8-year federal legal battle that the shoddily-run plant caused their cancers. NUMEC’s former plant sites are undergoing an on-again, off-again cleanup that may last until 2031 and ultimately cost US taxpayers half a billion dollars. Grant F. Smith is the author of the book Divert! NUMEC, Zalman Shapiro and the diversion of US weapons-grade uranium into the Israeli nuclear weapons program. He is director of the Institute for Research: Middle Eastern Policy in Washington, D.C.